hile growing up just 30 miles from Glacier National Park, Teena Wood saw buffalo roaming the fields of Kalispell, Mont., so moving from a town of 10,000 to the big city of Seattle was a culture shock for the eight year old. But after 20 years in the Emerald City, Teena came to Portland, where she's not only an artist but also served as director of the Oregon Feng Shui Guild in 2001. She still provides feng shui and color consultations. The whimsical style of Teena Wood's art is strongly influenced by years of studying and drawing cartoons. She even created her own comic strip, The Adventures of Mz. Mouse. "Mz. Mouse lacked self confidence, but was into personal growth and always wanted to improve herself and find her inner beauty," Teena said. "She was my alter ego." Teena marketed the strip and was published in various publications throughout Oregon, and one national magazine, Twinsworld. Locally, it was published for two years in The Woman's Journal. "I also created Amelia Chairheart, Mz. Mouse's best friend," she said. "Amelia was in a wheelchair, was a playwrite and had her own dance studio. She was an inspirational character." There were also the twins, Teena and Deena, nieces of Mz. Mouse. Teena is a twin, too, but her twin lived only three hours. "Being a twinless twin has affected me my whole life," she said. "I believe she would be a writer if she had lived. Studies show that twins in general are very creative people. I invented the twin characters to heal my own wounds from losing my twin at birth." Teena's hope is to eventually write a children's book using these cartoon characters. Ideas and inspiration come to Teena from many sources: something she sees, what someone says, or even a picture she wakes up with in her head. "When I painted 'The Cat Lover,' I kept seeing a picture of a purple cat leaning sideways," she said. 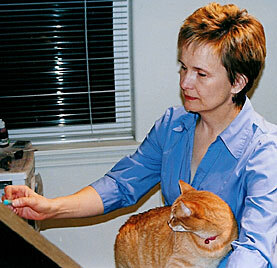 "So I sat at my easel and painted that purple cat. 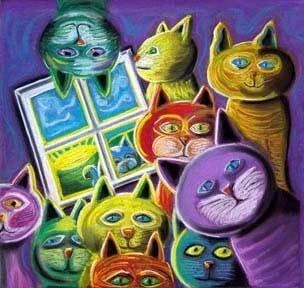 Then I added another and another and another and, before I knew it, I had all these cats." Teena works mostly with pastels for the richness and texture they create. "I often draw on black paper, which gives more intensity to the pastel colors," she said. "Just recently I started drawing on Wallis sandpaper, which creates even more texture and really holds the pastel in many layers." 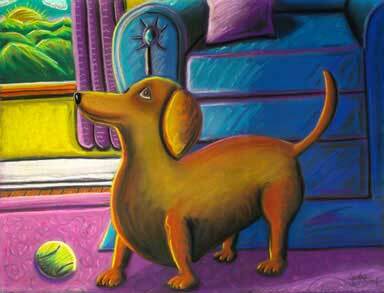 Two of Teena's favorite artists are Peter Max and Grandma Moses. "I love Peter Max's wild and free style; he uses color with complete freedom," she said. "Grandma Moses' scenes are primitive yet create a story of simplicity and warmth." Teena sees herself as a combination of the two  feeling a connection of their styles in her work. "I also love Thomas Knight and his living-room scenes with the open windows looking out on water," she said. This month, Teena's art is showing in Portland at the Starbucks on Northwest Eleventh and Glisan in the Pearl District, and at the new Healthy Pets store on Northeast Alberta. "It's a pet store with an artist gallery attached," she said. "I'll be their featured artist for the month and I'll be there in person Jan. 27 from 6-9 p.m."
Whether drawing, doodling or creating, art has always seemed as natural as breathing to Teena. "I've been doing some form of art for as long as I can remember," she said. "As a kid, I often spent hours and hours drawing in my room. "I always excelled in art class. It seemed I just knew how to draw and be creative. I didn't really think about it." Teena remembers drawing lots of pictures of houses, which are now a common theme in her paintings. She loved coloring books and had a knack for color coordinating. When she didn't have a pencil or crayon in hand, Teena was reading Scrooge McDuck, Dot, Little Lotta and Mickey Mouse comic books. "I knew I had found something that made my heart dance, hours fly like seconds, and allowed me to express myself in magical ways beyond words," she said. "And I knew then that this was somehow going to be an important part of my life." Teena's parents were artistic in their own way and her sisters are both creative. Her mother was a stylish dresser with never a hair out of place and knew how to use color and design in decorating their home. Her father was a carpenter and built one of their houses. He also created a mountain-goat statue that was designed after the Great Northern Railway goat. He sold and marketed the goats all over the country  several are in a museum in Montana. "Both of my sisters are very artistic, too," she said. "Carolyn makes beautiful quilts and afghans. Maggie manages the gift shop of a resort in Temecula, Calif., that she and her husband run. At one time, she owned her own yarn store in Seattle called Old Mother Hubbards." Teena was studying interior design and fine art at the University of Washington in Seattle when her life took a turn and she changed course. "Instead of finishing my degree in art, I got my B.A. in communications from Marylhurst University in Portland," she said. 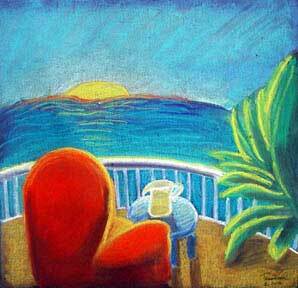 "I then worked many years for two major health organizations, all the while continuing to do art, but more as a hobby. "I never felt I had the confidence in myself to really pursue my art studies until now." Teena has taken art classes over the years, but has mostly done her own thing and experimented with different tools and media until coming up with what she does now. Her many detours and years of working at "respectable" jobs have only led Teena back to what she originally knew to be true  she must express herself through some form of art. "I enjoy creating art that makes me feel good and I love to see other people enjoying it," she said. "My wish is that somehow my art will give people a feeling of hope or that it somehow touches their heart." The name Follow Your Heart Artworks comes from Teena's desire to have her paintings reflect joy, peace, comfort and healing. "The world needs a lot more of these," she said, "and if I can add a little joy through my art, then that's great!" Teena's vision is to have shows throughout the country and to market her art as note cards. "I've finally come to a place where I'm doing what I really love to do," she said. "What else can I ask for?" E-mail Teena at teenawood@earthlink.net and visit her Web site. You can reach Kathy at kanderson138@comcast.net, and draw on other Sketch Pads.